We have a traditional English restaurant in the heart of beautiful Broadstairs called Aqua 43. It has been in our family since 1972 and serves wonderful fish and chips, roast dinners and pies using local ingredients wherever possible. I love to bake puddings and cakes for the restaurant when I can. In March 2012, I was faced with a sudden change in my work circumstances. Always trying to see the best of a situation, I thought I would take the opportunity to do something that involved everything I just love: baking, parties, friends, family – all wrapped up in a little vintage parcel. 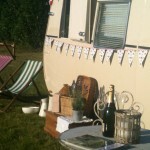 The idea of owning a vintage caravan became a bit of an obsession! After several months, I found my perfect little vintage caravan! A 1960’s 2 berth Cheltenham. I travelled with my dear husband to Bristol to collect it. It was torrential rain but as we pulled into the place she was stored she certainly brightened up our day. Her owner had spent much time restoring the outer body and whilst the inside was clean and tidy it was just ready for me to glorify. Not everyone understands my dream – they will soon. I have had many hilarious conversations with friends about what my little caravan could be called but eventually I decided upon Bessie – she just looks like a Bessie and in our Jubilee year it is fitting to have a name that is sometimes used as a shortened version of Elizabeth. I know my friends and family think I am mad but my dear sister-in-law always manages to switch on to what I am thinking and soon went into action to help. We pottered around Canterbury in search of vintage style fabrics – it was great fun and all finished off with a lovely cream tea. I decided upon some lovely Clarke and Clarke fabrics for the seats and curtains with some Cath Kidston cushions and accessories of course. But it was bad timing – my sister-in-law (official needle-woman) went on holiday for a week. I’ve never had much patience so waiting is going to be hard. 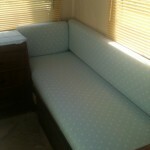 My lovely dad helped with the upholstery – couldn’t have done it without him! The seats had been screwed to the walls and the task was trickier than I had first thought. However, six hours later mission one was complete and looking wonderful. Raining again so thank goodness for a large dry stable to work in. Goodness, I’d forgotten what a perfectionist he is!